At one point, the Blue Hawaiians mounted an overwhelming escape and jumped from the small closet at 116 Laurel Heights onto the French door curtain rod. They demanded, and received, uniform bright red hangers. The Blue Hawaiians ranked themselves, with the finest in front and others following sequentially. I was in Blue Hawaiian acquisition mode, matched by blue Converses. The shirts were purchased in Austin and San Antonio thrift stores, the Chuck Taylors from the Converse outlet store in San Marcos. Resolution of a generous girlfriend’s problem with mixed hangers sent me to WalMart for 50 hangers at a dime a piece. At the time, the relationship was worth $5. It took quite a while, but that relationship didn’t make it. It did, however, leave me with a wealth of red hangers and some snooty Blue Hawaiians. For the past year I’m in a job that has a dress code, and in gary style, that means a change of uniform: blue (varied shades, azure to indigo) button down long-sleeve shirts, 100% cotton twill khaki or blue pants, those trouser socks and dress shoes. 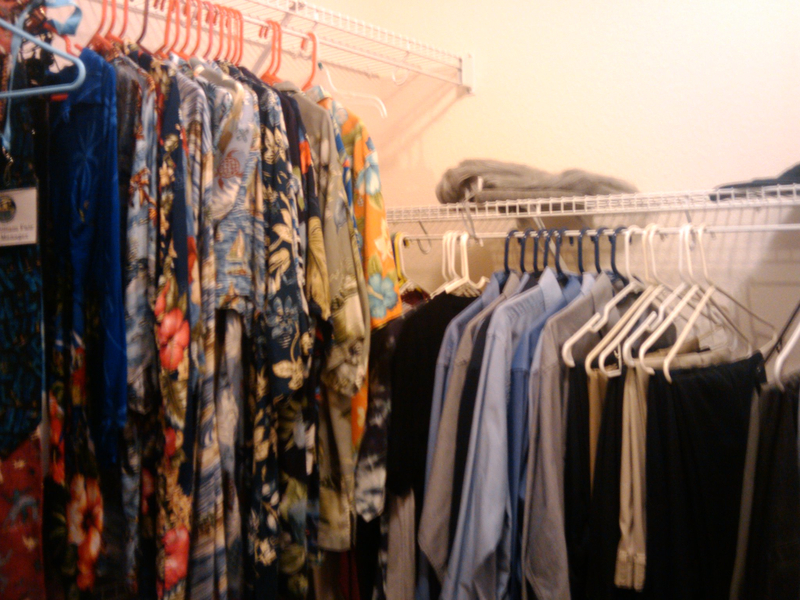 I live with a sweet woman and a huge closet, allowing the wardrobe to diverge into distinct neighborhoods. Up on the hill as this small town’s elite – the twills, blue oxfords, Blue Hawaiians and best t-shirts. The blue oxfords have been growing recently, doubling in population with eight or nine new additions. A couple of weeks ago, they requisitioned matching blue hangers and an order – not by preference, because they are all excellent – but carefully layered in a random order of contrasting shades. The twills were insanely jealous, riled up by their new superstar, the L.L. Bean dark navy. Suddenly, white hangers were to be used exclusively for ALL pants – the khakis lobbied for blue hangers to match, but blue does not complement the blue twills and Bean would not allow two different hangers in their row, so… Oh, and by the way, they are in contrasting layers as well. I heard, but cannot confirm, that many of the t-shirts vote with The Rent is Too Damn High Party.